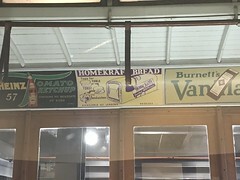 Some museums require a complicated explanation about how to get there; not so with the San Francisco Cable Car Museum. Both of the Powell Street lines stop outside of the museum, and the California Street line has a stop a few blocks away. Despite living in San Francisco for almost a decade and a half, I’d never visited the Cable Car Museum, and decided on a whim today to pay a visit. Most of SF’s tourist attractions fall into one of two buckets: a horrid tourist trap (Pier 39, Grant Avenue in Chinatown) or are actual gems that you shouldn’t miss (Telegraph Hill, Musee Mecanique, Cliff House.) The Cable Car Museum, I’m happy to report, falls into the latter category. That said there’s not much to the museum itself. The real show here is watching how the cable car system works. I suspect an average tourist doesn’t give much thought as to how cable cars work — it’s just a weird old wooden train with a bell, right? Just like a big version of Mr. Rogers’ trolley? Anyone with that notion will be in for a shock if they visit the museum and watch the motors pulling the cables. More on that in a moment. The Cable Car Museum is free to visit and is open most days. There are bathrooms open to the public, and of course a gift shop with books and trinkets. Much of the museum consists of panels explaining the history of the system, how it was invented, etc. Most of these factoids you could just as easily find on Wikipedia. 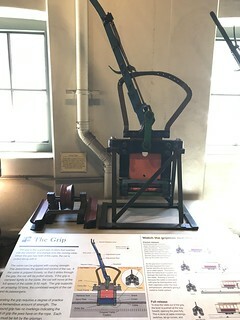 The most interesting of these exhibits explain in detail how the mechanisms that power the cable cars work, for example the grip and the truck pictured below. Another cool feature are the old cable cars. Did you know that at one time they had two cable cars hitched together? Or that ads on public transit apparently go way back further than you may have thought? These are the quirky little details you won’t find anywhere else. 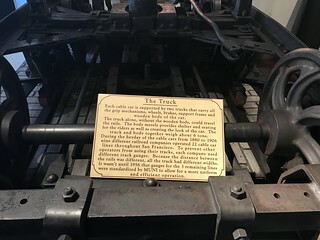 But like I said earlier, all of this is really secondary to what the museum is really about: seeing the mechanism that powers the cable cars up close. 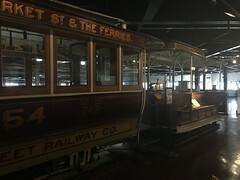 It’s like a factory tour in a way — the museum’s located inside the building that powers the entire cable car system in San Francisco. Several enormous wheels spin a thick braided metal cable, one for each line. That cable is what the “grip” mechanism in each cable car latches to, which is what propels tourists between Powell and Market and Fisherman’s Wharf. Normally you can’t see those cables since they’re underneath the street, but here they’re in full view. Apparently it’s some guy’s job to sit there watching the cables, checking for damage as they wiz by, and if there are any frayed bits they have to be repaired at night when the cable cars aren’t in service. While I’d assume this is the sort of job that could be easily automated, in the spirit of preserving a historical system maybe that would be cheating. 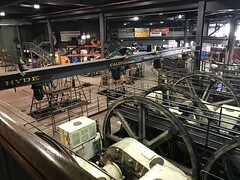 In the basement of the building you can see the wheels that act as pulleys, tilting the cables into different directions for each line. Unfortunately it was too dark down there to get a usable photo. 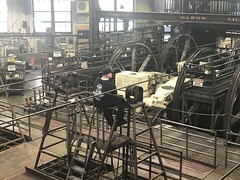 A portion of the building is devoted to a machine shop. The cable cars are custom made, so if a part needs to be replaced it’s not like SFMTA can go on Amazon and order a new one. I spotted several fresh looking grip mechanisms sitting in one corner, ready to be installed as needed. Since it was a weekend there was unfortunately no activity in the machine shop. There might be more action to see if I’d visited on a weekday. One last fact to mention here is the noise level. With the motors driving the giant wheels and the cables spinning around, this is not a quiet museum. Check out my very brief video below to look and listen to those motors in action. You are currently browsing the MrEricSir.com blog archives for April, 2017.